Above is a picture of the entrance to the Pocahontas mine. As with most coal mines, narrow-gauge railroad tracks ran throughout the mine. Railcars were used to transport men and coal. The rail lines exited the Pocahontas mine here. Coal was brought out in the railcars and loaded into waiting trucks and trains. The coal was hoisted out of the mine in [rail] cars. The cars were taken off the cage and taken to a rotary dump at the tipple. Coalwood only had one shaft. It was used to bring the coal out and put men and supplies in. The hoist was very powerful, and, in later years, we would hang equipment on the bottom of the cage to lower it into the mines. Once the equipment was on the bottom, we would take it to the motor barn for final assembly before taking it to the section. Once the Coalwood mine and Caretta mine were cut together [underground], it wasn't practical to have two tipples; so a lot of money was spent on the Caretta tipple to get it up to handling the coal from both sides At Caretta, they had another shaft called a "skip." It brought the coal out of the mine .The [rail] cars full of coal were taken to Caretta bottom, run into a rotary dump to unload the coal, and the skip buckets took it to the outside to be processed in the tipple. The Caretta man-shaft hoist was used for men and supplies. It did not have steps --only the hoist. The Coalwood shaft had steps. I walked out the mine a couple of times using the steps. It was a long way up or down. I didn't mind being underground, but I felt uneasy going up or down the steps. The Coalwood shaft, I am told, was 674 feet and the Caretta shaft was around 500. We are looking for photographs from Coalwood and Caretta that show all of the above. 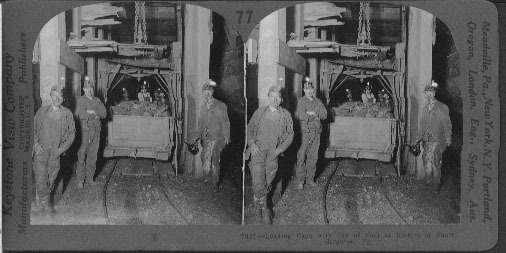 In the interim, we found an interesting photograph from the Cleveland [Ohio] State University photo archives of a mine in Pennsylvania. Bottom of Shaft, Scranton, Pa.
Used with permission of Cleveland State University. Library's Link Location Link location of this specific picture. Here is their text describing the picture (slightly edited). Here you are at the bottom of an anthracite, or hard, coal mine. This is the lower end of the large shaft which leads to the surface of the earth perhaps 1,500 feet above. A carload of coal is on the elevator or cage ready to be lifted to the top where it will be dumped into the breaker. The cage and the shaft are the center of a mine of this kind. To it lead the many switches from acres of underground rooms. It is necessary that this shaft be constructed of strong materials. For not only must all the coal be brought to the surface through it, but it is the only exit of the hundreds of miners. You can see for yourself that the shaft and cage here shown are strongly made. You will observe the large timbers, the heavy framework of the cage, and the big safety chain above. The car weighs one ton and the coal two tons. The cage weights 1 1/2 tons and the 1500 feet of wire rope, which lifts it, another 1 1/2 tons. That's six tons or 12,000 pounds total. You will be interested to know that the rope is made of strands of woven steel wire, 19 wires to the strand. It is 1-1/8 inches in diameter and can lift a weight of 60 tons. Some of the cages used in these mines have two decks, one above the other. By this means, two cars of coal can be lifted at one time. Some of the Pennsylvania shafts are sunk 3,000 feet beneath the surface of the earth. This means that some of the coal is actually mined below sea level. In many of these deep mines it is necessary to have extensive pumping equipment to remove the inflow of water. Pennsylvania mines, however, are shallow as compared with most of those in Europe. Some of the European mines are over a mile in depth. Of course in the movie October Sky, we see the men getting into the cage. This, of course, is not the real cage used in Coalwood. In Coalwood the cage would have had railroad tracks embedded into the floor. At times the cage would carry men up and down the shaft. At other times, it would carry railcars of coal up and empty railcars down the shaft. You also have to remember that electric locomotives and huge pieces of mining equipment were used inside the mine tunnels. All of this was lowered down the shaft either in this cage or chained under it! Before the mines became mechanized. the coal was dug by hand, loaded on cars and sent to the bottom to be taken outside to the tipple. 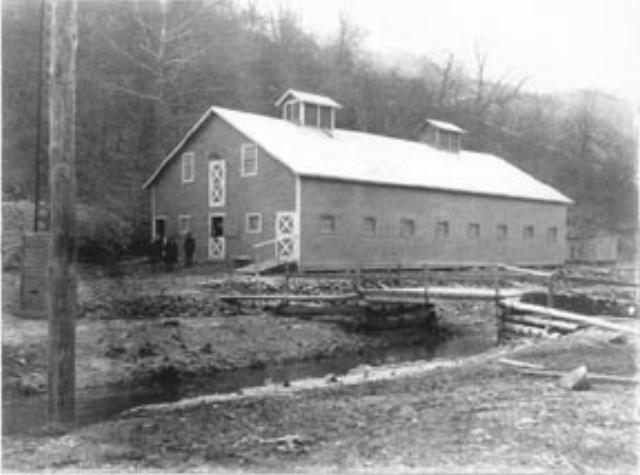 .The first hoist at Coalwood was steam powered. The motors that were used were battery powered. These were used on the main line. They would gather up the cars from the different sections on Coalwood Bottom [the bottom of the mine shaft.] 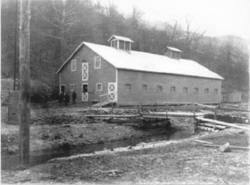 There was an underground mule barn where the mules were housed. The mules were used to get the cars from sections out to where the motors could pick them up. Mr. Carter was very strict about the care of his mules. They were to be fed, watered and never whipped. The stalls on the Coalwood Bottom were lighted and had fresh water. When a mule was hurt or too old to work, they were taken outside and either kept in the mule barn which was located at the mouth of Mudhole .or sold for farm use. I was told that when Carter sold the operation, the new owners sold all the mules to a rendering plant. When the mules were taken out of Coalwood, people stood on the streets and watched them go. Some people were seen crying. When I worked at Coalwood, I went to the old barn underground, and you could still see the names of the mules on the walls of the stalls: Jed, Red, Jake, etc. DGbarn: Mule barn at mouth of Mudhole. Photo compliments of the David Goad Collection.